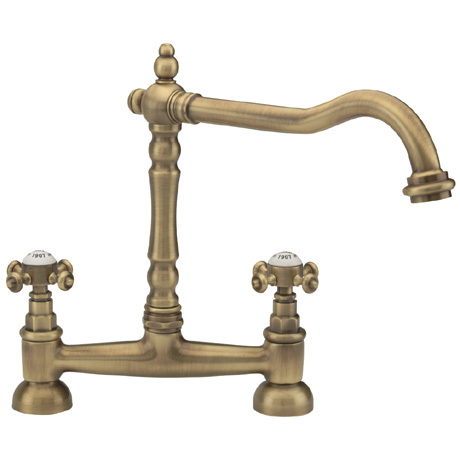 Tre Mercati - French Classic Mono Bridge Sink Mixer in Antique Brass is a part of the "French Classic" range from Tre Mercati. The French Classic is a traditional range that will bring Opulence and prestige to your kitchen. The Tre Mercati French Classic Mono Bridge Sink Mixer is made to the highest standards using the latest methods and best materials. Q. Hi, I have no outside tap. Is it possible to fit a hose connector? Hoping an internal thread exists! Hi Jason, the end of the tap can be screwed of this is a 25mm thread size. Thanks! Q. Will this tap age further or is it polished to stay this colour? Hi, this mixer sink has a lacquered finish to protect the finish but may still fade over time. It works at a minimum of 0.5bar. Thanks! Hi Steve, we're not sure what part you are trying to find the measurement to. If you would like to email info@victorianplumbing.co.uk with more information we would be happy to try and help you with this matter. Thanks! Hi, the manufacturer has advised that the Tre Mercati French Classic Mono Bridge Sink Mixer will work at a pressure of 0.5 bar and upwards. Thanks. Q. What is the height of the taps please as our windows open inwards? Hi Heather, the tap is 265mm in height. A full diagram with dimensions can be viewed on the product dimensions tab on the product page. Thanks! Q. Does this tap swivel over two bowls or is it fixed? Michahla - Yes, the tap swivels.
' Two Words'' Fantastic quality. I'm in love with a set of taps! I'd actually ordered my taps from a competitor, but they were out of stock, so ordered this, which was my second choice. My fairy godmother must have been watching over me - is it possible to be a little bit in love with a tap? Such a beautiful design, fabulous quality and absolutely the finishing touch to my new kitchen. This is one very happy lady.